Combined with the secure2 quick connect tubing attachment and our easy-to-use dressing application, Medela Invia NPWT Systems deliver therapy confidence with ease. Charcoal foam, manufactured using a reticulated polyether and polyurethane hydrophobic material. FitPad suction interface with Quick-connector. Transparent film (one or more pieces depending on the kit size). All components are packaged together and sterilised using ethylene oxide (EO). Invia Foam Dressing Kit is available in four sizes: Small, Medium, Large and X-Large. Conveniently packaged kits with individual sterilised components. Transparent film (one or two pieces depending on the kit size). Saline (one or two vials depending on the kit size). Invia Gauze Dressing Kit is available in two sizes: Medium and Large. 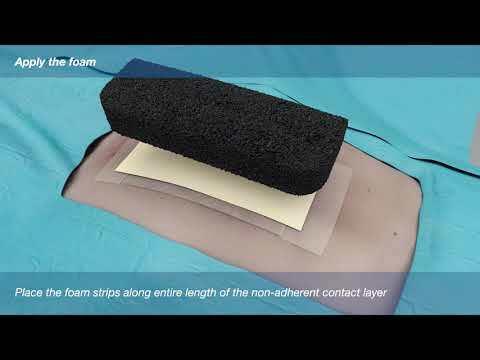 Invia White Foam is an open-cell polyvinyl alcohol (PVA) foam with hydrophilic properties and effectively absorbet to ensure reliable removal of wound exudate. Provides a barrier to bacterial penetration using silver ions activated by moisture delivered in the dressing which can help reduce infection. Invia Silverlon NPWT Dressing is available in two sizes: 4”x 5”(10 x 12 cm) and 5”x 8” (12 x 20 cm). The intuitive markings of the Transparent Film simplify the application technique. The Transparent Film size is 26cm x 32cm. The low profile design and flexible wings of the Invia FitPad permits appropriate placement in difficult anatomic locations. "I am currently using the Invia Liberty pump on all my patients requiring NPWT at both LTAC locations. I am very pleased with the simple application and maintenance with this closure device." "So far, the Invia Liberty has been the smallest and most quiet one, which our patients love!" NPWT: Deeper benefits, broader applications for wound vac. Today’s healthcare providers face a dual challenge: drive healthy outcomes for their patients, and drive healthy outcomes for their institutions. As standards rise and budgets shrink, they need to identify tools and strategies to meet both of these challenges at once.